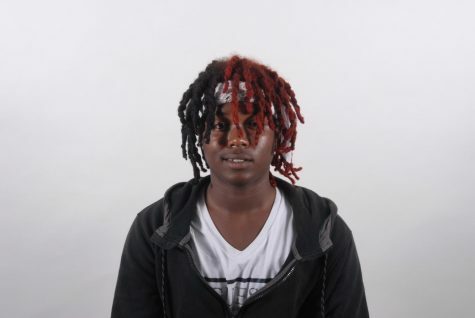 Carlon Singh is a 12th grader, he was born in Guyana. He is the oldest boy of 8 siblinga and they all look up to the eldest ones. His favorite colour is red. He has very unique look with his split hair one side red and the other side black. The red side is for the love and fire and the black is for death and solitude. When he graduates he wants to go to Full Sail University (which he just got accepted into!). He is going to study Audio Production when he graduate he will have Bachelor of Science in music, this career will take him 29 months to complete. When he graduate Full Sail University he wants to move to California, and in ten years he sees himself producing and making music and rapping. If he is not successful in the music industry he wants to be a philosopher. Carlon likes writing and his English class. If he had one supper power he would have super speed, that's why his favorite supper hero is the flash. His perfect out fit would be all white. If he could met anyone would like to met Malcolm X and Tupac. His favorite food is Mac and Cheese. He works at foot locker. He has a red noise pit bull. His ideal trip would be to Japan. He hate wet socks. He works at Footlocker.